Give Mom or Grandma a cheery collection of Mother’s Day flowers she’ll be able to enjoy all summer long in hues of pink, green, blue, purple, yellow, red and white. Hardy and long-blooming, our favorite annuals and perennials have overtaken the nursery this month with a sea of rainbow colors. Bleeding heart (clerodendron)– Dainty, heart-shaped blossoms in pink, red, and white love the shade and perform best in moist, well-drained soil. Sentimental and sweet. Grandiflora petunia – These funnel-shaped blossoms are abundant bloomers that are easy to care for and thrive in the sunshine. Pelargonium (geranium) – Attractively ruffled leaves and brightly colored flowers make these versatile plants graceful additions to a Mother’s Day hanging basket. Fuschia – Exotically-shaped stunning beauties in striking, two-tone color. These Mother’s Day beauties have long been appreciated for the cheer they bring to table arrangements, containers, hanging baskets and window boxes. Mix complementary colors for visual punch, or consider groupings of a single shade to focus on contrasting textures and heights. Looking for something pre-designed? We’re fully stocked with a huge selection of baskets suited for growth in a variety of conditions. 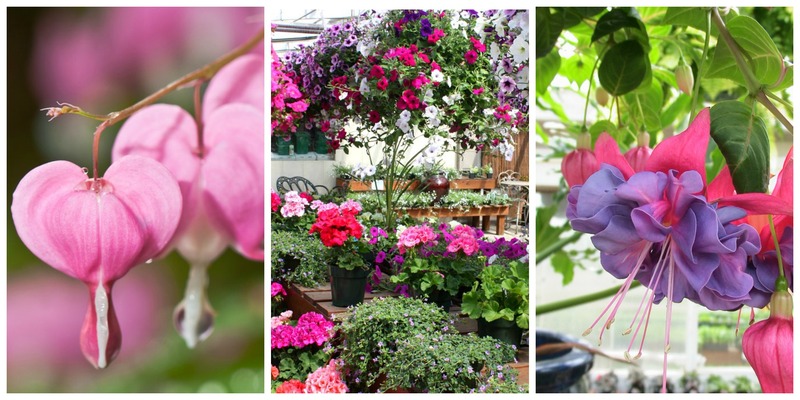 The garden center is overflowing with perfect gifts and pretty plants. Come pick out a surprise for your loved one or bring her in for a shopping spree on Mother’s Day. It’s one of the most beautiful and inspiring months of the year!